Bob Hope Airport in Burbank, California is a convenient airport in the best location for access to and from Los Angeles and the San Fernando Valley. The airport serves seven airlines and handles over 5 million passengers a year. 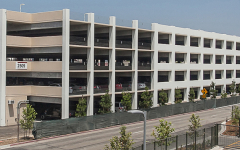 The $8.4 million Bob Hope Airport Replacement Parking Structure provides 1,046 parking spaces on five levels, totaling approximately 352,000 SF. 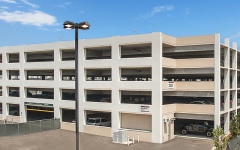 This structure is used exclusively for valet parking. Each level is about 71,000 SF and is connected vertically by an express ramp. 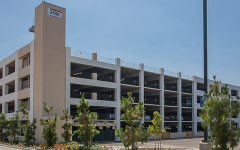 There are two elevators located on the west side of the parking structure, and accommodation for a future connection to the moving walk-way that links the valet area to the Regional Intermodal Transportation Center.